SPW053450 SCOTLAND (1937). General view, Greenfield, Glasgow, Lanarkshire, Scotland, 1937. An oblique aerial photograph, taken facing east. 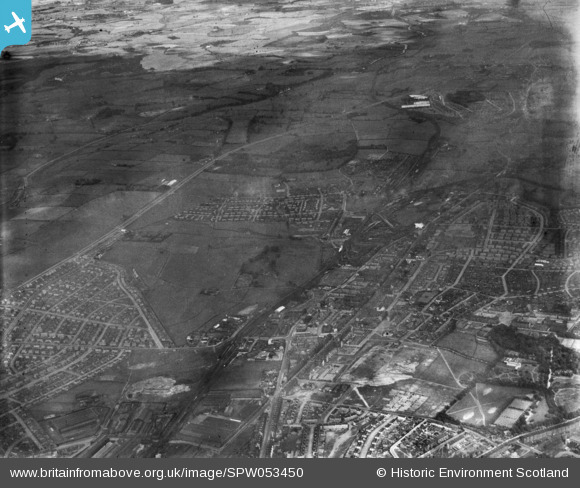 Title [SPW053450] General view, Greenfield, Glasgow, Lanarkshire, Scotland, 1937. An oblique aerial photograph, taken facing east. Balintore Street looking toward Amulree St. Bus on Shettleston Rd at McNair St.
Possible site of Parkhead Juniors first ground going by this early map. Apparently Scotts Electric Cinema (Denbeck St) sat here. St. Marks School, burnt down April 1967. J&T Boyd Ltd Textile Machinery. United Glass Old Shettleston Road. Carntyne Industrial Estate, 1950s. ~ Industries attracted to Carntyne Industrial Estate can be gained from the names of firms which set up business there - West of Scotland Wringers, South Wales Switchgear, Clydeside Machine Tool Co, Caledonian Tractor & Equipment Co and Clanross Knitwear. Hill St (Edrom St) ~ Palaceum Cinema was on the land in front of the gable end, left at bottom of street. Budhill Avenue – about 1910. Greenfield Park, home of Shettleston Juniors FC who have a long and proud history, with many achievements gained in their time thus far as well as young players furthering their career leaving to join senior clubs, Shettleston Juniors is the most successful club in junior history for players stepping up.